We have two news for you about two great Cricketers. One news is bad and other one is good. The bad news is that World's second fastest bowler from Australia Brett Lee has announced retirements from all formats of Cricket on Friday after which his 13 years International Cricket career has came to an end. Brett Lee is now 35 years old and facing lot of fitness problems. 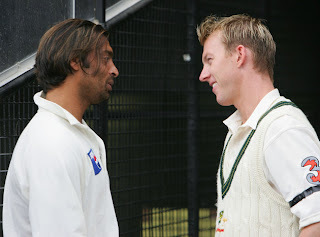 World's Fastest bowler Shoaib Akhtar who retired last year has said that World Cricket will miss a great bowler like Brett Lee. other cricketers has also paid him tribute. Now the good news is that one of the finest Batsman in World Cricket Kevin Pietersen has taken back his retirement from both limited over cricket formats T20 and ODI and announced himself available for these two formats. Few weeks back English Batsman announced to retire from T20 and ODI.